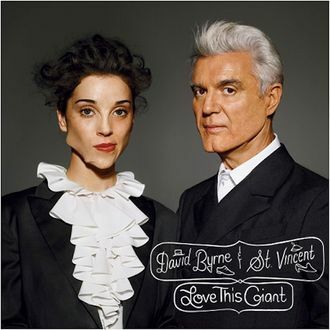 The David Byrne–St. Vincent Album Is Really Happening! David Byrne and Annie Clark have discussed their collaboration here and there over the last year (it was inspired by a Björk–Dirty Projectors Housing Works benefit back in 2009; it’s an “honest-to-god, straight-down-the middle” thing in terms of composition; there will be horns), but the whens and the whats of the project have stayed a little murky. Mostly you just imagined the duo vibing out in a tastefully appointed room with some saxophones, an impenetrable bubble of cool protecting them from the world. But they are ready to share! Their joint album, Love This Giant, is due on September 11 of this very year. There will be a joint tour; there is a sneaky-weird album cover; and if you are willing to part with your e-mail address, you can now sample the first single, “Who.” It does in fact use a bunch of horns. The David Byrne–St. Vincent Album Is Happening!